In September of 2006 I took Lila on her first (and so far only) trip to Japan. 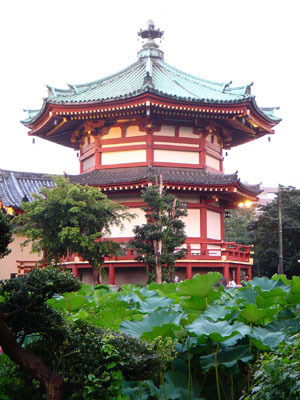 One of my favorite places is the area around Ueno Pond, a well-known site from back in the days of Edo. This is the Benten Shrine on the little island in Ueno pond. 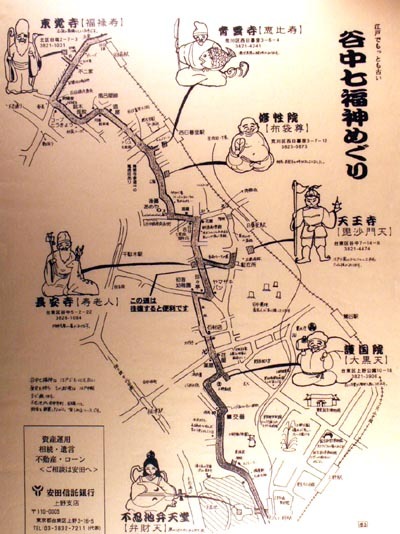 It is the starting point of the "Shichifukujin" (Seven Lucky Gods) pilgrimage I wrote about before. 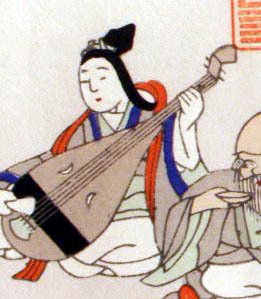 Benten is patroness of music and art, and the beauty of this shrine is testament to her power. 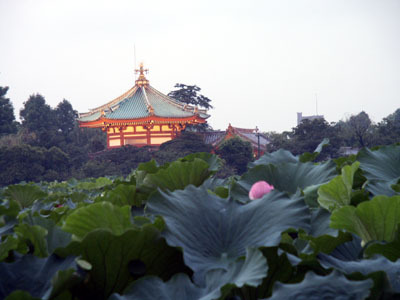 Here is a shot of the shrine through the riot of lotus leaves growing on the pond in that time of year. On this side of the pond you can't even see the pond! Lila captured this beautiful shot of a lotus bud. 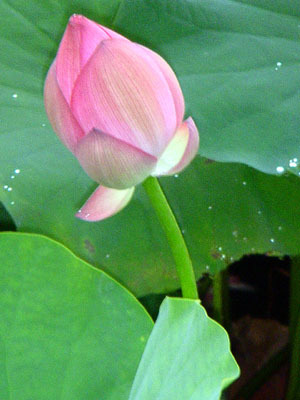 In Buddhist iconography, this represents potential (the opened lotus is the fulfillment of that potential). I have dozens more shots of this place; in the future, I'll show you the little causeway that leads to the shrine, with its cheesy kiosks and ancient monuments. In an ancient country with booming development, it's inevitable that relics will be unearthed. In Japan they have a simple, elegant, and holistic approach to dealing with this: they find a convenient nearby location, often a street corner or a piece of a pocket park, and pile up whatever they find. This adds a nice visual touch to the neighborhood, and provides objects of veneration for the locals. Here's a gang of them near my friend Simeon's house in Tokyo's Bunkyo-ku. 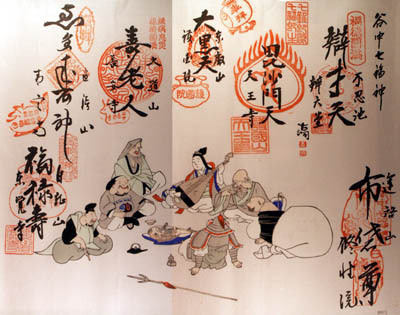 In the first days of a new year, it's a Japanese tradition to go visiting the "Shichifukujin," or "Seven Lucky Gods." This may be because it's believed that they visit you in your sleep on New Year's Eve; dreaming of them predicts luck for the year. One year while I lived in Japan, I did a pilgrimage starting in Ueno, and the beautiful little Benten Shrine in the pond in Ueno Park (Ueno no Ike, famous since the Edo Period). Checking in at that the shrine, you can buy a map and a small scroll (just a piece of paper). 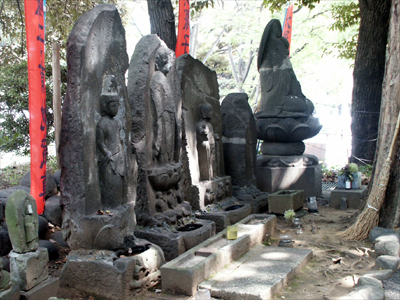 Follow the map and visit the seven shrines on it, one dedicated to each God. Volunteers at each shrine stamp the paper and do calligraphy on it. Here's my map, and my "scroll" (I shot it in two parts, hence the ugly seam; sorry). When I was working in Japan, I heard a persistent rumor. 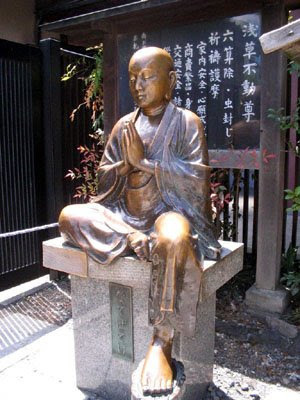 I heard that there had been a Japanese man who was a devotee of Avalokiteshvara Boddhisattva, known in China as "Guan Yin" and in Japan variously as "Kannon," "Kwanon," and "Kanzeon." Anyway, this devotee was going to make cameras, and wanted to name his product after this great Buddhist figure, the Bodhisattva of compassion. So he had a designer work up a logo, but it wasn't working. Then the designer suggested changing the spelling of "Kannon" a bit, and that's how "Canon Camera" came to be. A wonderful story, but unconfirmed--until last March, when Lila sent me a link to this page, from which I stole the images below. I found a more coherent version of the story on the Canon home page, which confirms the details of the "rumor" as I heard it. Case solved. 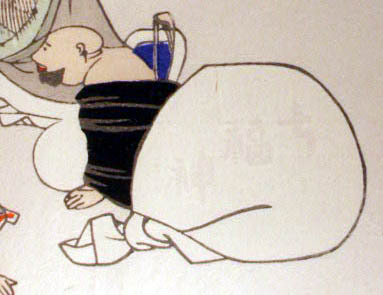 Footnote 1: Another Canon page confirms that the "Kwanon" was never produced, and that the lens for the first Kwanons was called the "Kasyapa," the name of one of the historic Buddha's key disciples, and the purported founder of the Zen sect because he could "see" the truth of the Buddha's teachings clearly. Footnote 2: When I was a tour guide at Hsi Lai Temple, I would tell this story, and say that security cameras made me think of Guan Yin (Kannon) watching over us. One visitor told me I had a rather naive understanding of the purpose of security cameras! When I decided to move to Japan, my dad was really pleased. He had been there in 1945 (for less happy reasons) and kept telling me stuff like, "You'll see the old ladies in their kimonos, sweeping their porches with big brooms." Sure, Dad, I thought. That was over 50 years ago. Well, I didn't actually see old ladies sweeping porches in kimonos. But I did see kimonos. And big brooms. I saw lots of traditional clothing. Kimonos I only saw for formal occasions (weddings) or on restaurant workers. But other types of traditional clothes were not uncommon--jinbei, a sort of "shorty pajama"; and samue, the work-wear worn by monks (and kitchen hands, and anyone who wants to be comfortable--I walked from Tokyo to Kyoto and around Shikoku in samue). My favorite, though, for men and women, is the yukata. Often mistaken for kimono, they're actually much simpler, barely a flimsy bathrobe. With the right accessories, though--an obi (belt), geta (sandals), a bag and hair ornaments for the ladies--they can be quite stylish. I've seen them on people going to picnics and fireworks displays, or even just shopping. 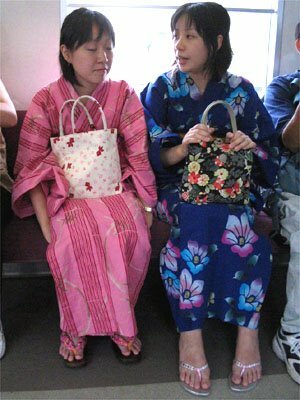 Here are some some girls in yukata, on a train in Tokyo. Nothing special, just casual wear Japanese style. There's a very funny homepage called "Statue Molesters" ("Find a statue... make it smile"). Well (as they do) the Japanese have their own version of statue molesting. If you look carefully, you'll see that his knee is "shining." That's not just a trick of light; it is shinier, because people (mostly old ladies) have been rubbing it. The common belief is that, if some part of your body is bothering you, rubbing the corresponding part on a holy figure will heal you. 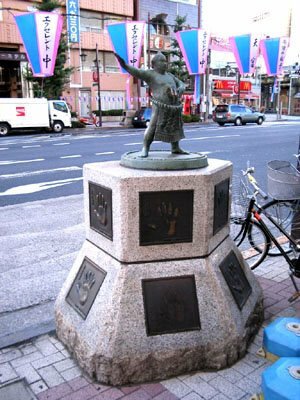 Now look at this statue of a sumo wrestler, found in the Ryogoku area of Tokyo, home of the Kokugikan (National Sumo Stadium). That's right: they've been rubbing his belly! Should we assume from this that Japan is a nation of dyspeptics? Probably not. The belly is the seat of power (and not just in sumo wrestlers, who slap it to intimidate their opponents.) Near the belly button, it is the center of gravity in the body, the third chakra (that of power) in Indian belief, and very near the "solar plexus," a place you would be familiar with if anyone has ever hit you in the stomach and "knocked the wind out of you." 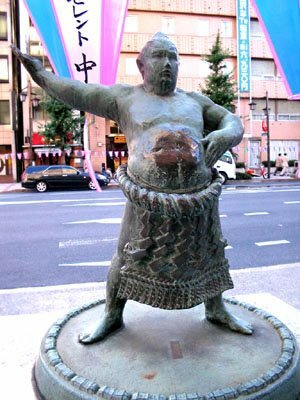 So passersby rub the rikishi's belly for power. I rubbed it, too. I saw this sign on a ramble (heading for a temple, of course) in a southern suburb of Tokyo. There is a strong association of "frog" and "healing" in Japan. My friend Karen once invited me to help carry a portable shrine up Mt. Tsukuba in Ibaraki Prefecture (for which I've never quite forgiven her). Images of frogs are ubiquitous there; there's even a giant one squatting on top of a phone booth (or there was in 1997). It turns out (of course) there's a myth. 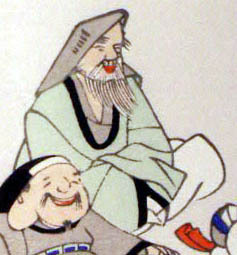 A Daoist immortal named Gama Sennin was imported from China, where he's Liu Hai. 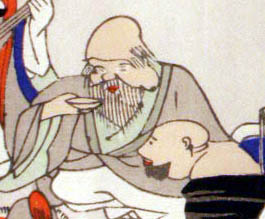 Liu Hai was a 10th-century alchemist who learned the secret of immortality from a toad with three legs (called "The Money Toad"--it's a long story). 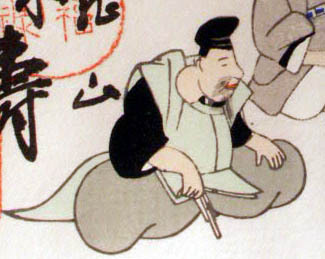 Gama Sennin ("The Toad Immortal") is often found in netsuke and other folk arts. He walks with a cane, and generally has a three-legged toad on his shoulder. This toad has magical properties. There is a species of toad that lives on Mt. Tsukuba, called Tsukuba-San gama-gaeru (Mt. 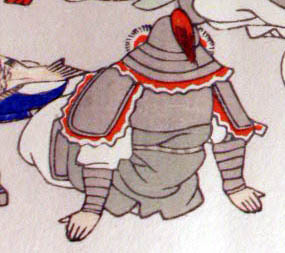 Tsukuba toad). 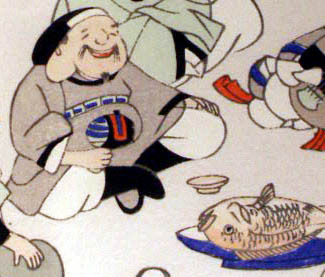 His sweat (really, this is not legend) is gathered and made into an ointment called "gama no abura"--toad oil. Although a "folk" remedy, modern doctors attest to its value. So toads and healing are associated in the Japanese mind. 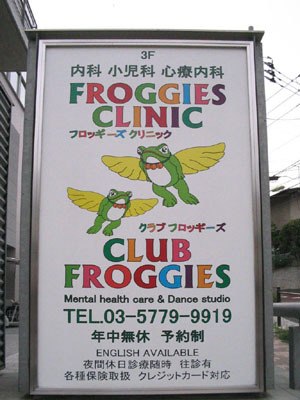 Could this be the source of the "Froggies Clinic" brand? By the way, I can't help but notice that the illustration resembles a couple of Balinese flying frog statues given to me by a TV actress I used to date.Another source of healing? These "Three Wise Monkeys" are seen everywhere in Japan. 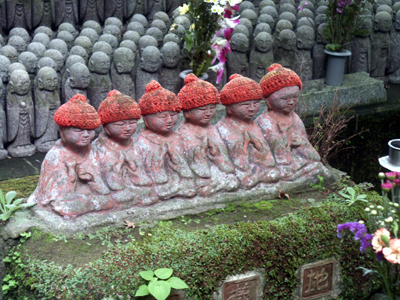 The originals are supposed to be at Tosho-gu shrine in Nikko (though this may just be the most popular example). I have a picture of them I'll publish some day. 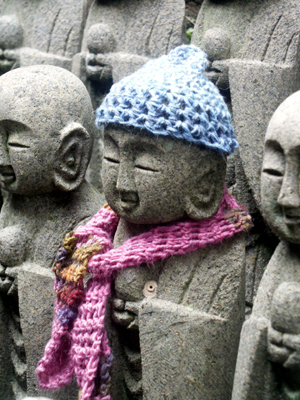 My favorite set, at a small temple in Kyoto, had a fourth monkey covering his groin; guess what that meant! 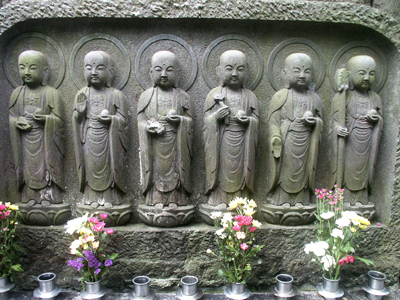 Anyway, here they are on some stones at Honsenji, a temple on the old Tokaido Road in Shinagawa, in southern Tokyo. 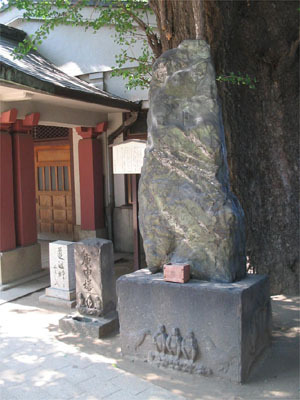 The first picture shows the situation of the stones under a large gingko tree on the temple grounds. 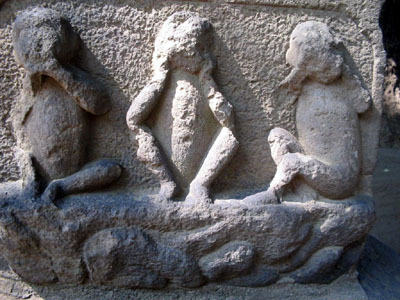 The second shows the monkeys at the base of the large stone, and the third, at the base of the mid-sized (center) stone. The order in both cases seems to be speak - hear - see. This is not always the case (but it is at Nikko). The wearand tear on the carvings indicates that they are quite old. My dad and Gandhi: On our dinner table when I was a kid there was always a toothpick container with the three monkeys ranged around it. My dad was in Japan in late 1945; I wonder if he brought it home with him? Anyway, it's a prized possession. 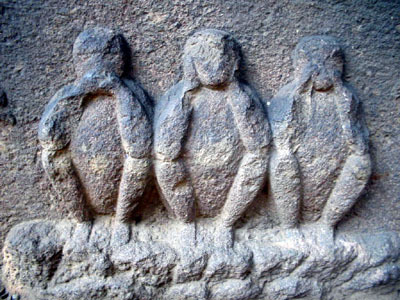 And according to the Wikipedia article on the monkeys:"Mahatma Gandhi's one notable exception to his lifestyle of non-possession was a small statue of the threemonkeys." The article also has a discussion on the "Meaning of the proverb." I think that's silly. Isn't it obvious?